Cleaning and staining wood decks is a relatively simple process if you have the time and ability to get the job done properly. Pick a day after the winter weather is gone, grab a friend, and give your deck new life in a single afternoon. The first step in cleaning and staining wood decks is to replace any loose or worn out boards. Look for damage, and be sure to secure any popped out nails and patch any cracks you find with wood filler. This is available for purchase at your local home store. Find a cleaning product that is appropriate for wood decks. As long as your deck is in relatively good shape, a hose and warm, soapy water with a stiff brush will get the job done. You can also opt for a formal deck cleanser that is designed to effectively get out tough grime of all types. The cleanser gives you the advantage of also removing spots and stains. Use a deck stripper to remove any past sealants or waterproofing. If your deck has an opaque finish, this will also be effective in removing it. Decks that are made out of redwood floorboards will then need some sort of brightener to restore the natural color and features of the wood. Put these solutions into a squirt bottle or pump sprayer for even distribution and to avoid oversaturation.Heavily water plants surrounding the deck, and cover them with plastic. Again, sheeting can be found at your local home store. Spray your cleaning formula onto the deck, and then scrub with a stiff brush. 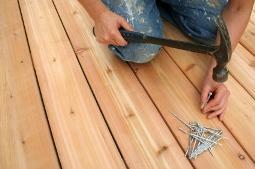 Rinse off with your house and then repeat for all sections of decking. You can then allow the deck to air dry completely. It's a good idea to check with any specific information your deck manufacturer provides, and if you built your own outdoor feature, researching the treatment of specific kinds of wood. This will ensure your deck is in good shape and ready to be stained. There are many different types of wood stains that can work on a standard deck. Again, you'll want to check to see what your deck can and cannot sustain. It's best to choose a stain that is resistant to water, mildew and UV rays. This will extend the life of your deck even longer. Some stains will even seal to damp floorboards, meaning you don't have to wait for your deck to be completely dry and you can finish the whole cleaning and staining process in a single day. Finally, stain your deck. You can do this most effectively when the weather is warm and as free from humidity as possible in your region. Use a paint roller to apply the stain just as you would a coat of paint. Roll in the direction of the grain, starting in corners and working outward. Finish off touchups with a paint brush, and then allow your deck to dry completely before furniture is moved out onto it and regular use resumes. Staining a deck is not very difficult, but there are things you can do to improve the outcome even further. First and foremost, take your time. Do not rush through such an important project. Do not skip any steps - from scrubbing to brightening, each one is essential. Avoid cheap stains - many are on a budget, but many also desire long-term endurance of their deck. Go for a mid-priced stain at least, and you will see a big difference in your outcome. Finally, check out the water-based stains available. They have improved a lot over the years and can give you more bang for the buck.